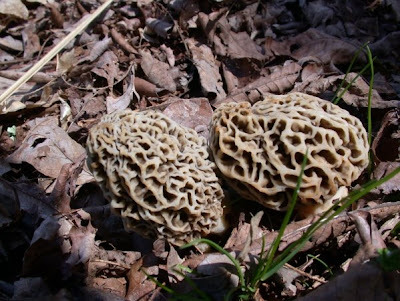 After days of rain and now summer temperatures, the backyard is producing morels. 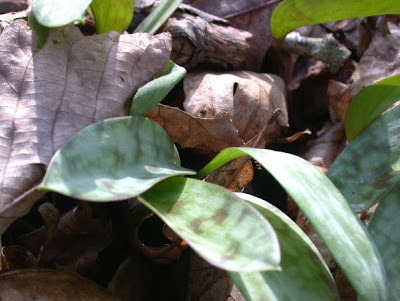 It is easy to spot these critters in the yard, but not so easy in the leaf litter as shown below. It is always cool to see these guys in the backyard. This has been a good period for collecting morels. The temperatures have been in the high 80's and, with all the previous mosture, the fungi have flourished. 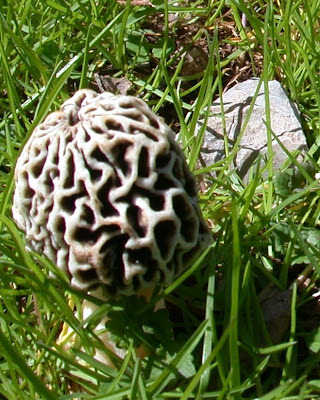 Folks around here have easily been collecting morels by the 100's. 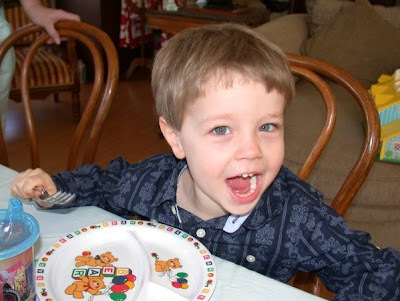 Yep, the Easter Sunday meal was a great meal with a wide variety of goodies. 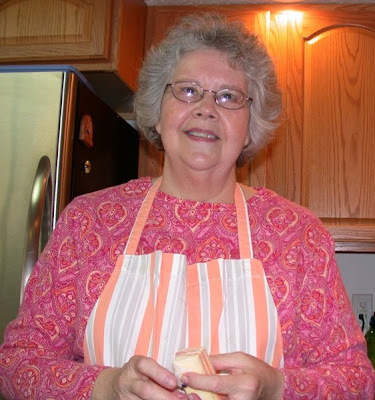 The good wife had planned the meal with turkey, ham, cooked apples, cinnamon pickles, scalloped potatoes, picled eggs and beets, rolls, broiled mushrooms, and other gourmet treats including desserts. 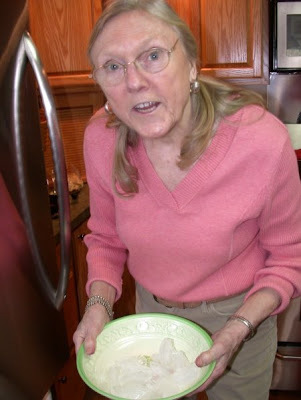 Sister Judy is preparing the salad. The major "director" was Judy. 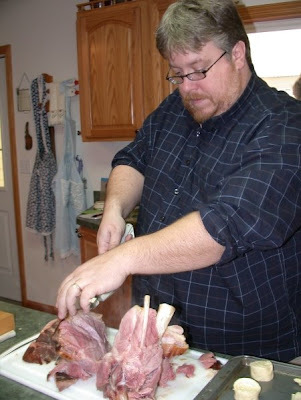 John had the task of carving the ham. The turkey was already fixed so all we needed was to heat the bird flesh! Diana is collecting the ice cubes from the freezer to place in our water glasses. This is a hard task. 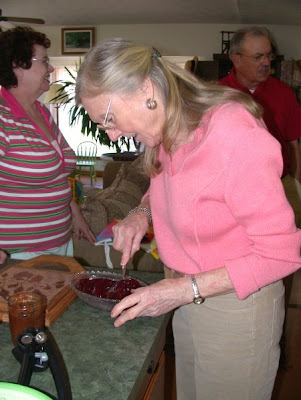 OK, Diana is seen here slicing the cranberry sauce. 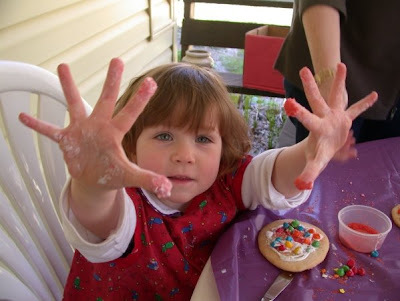 She does a very artful job! I have never seen anyone slice the sauce in such an efficient manner. 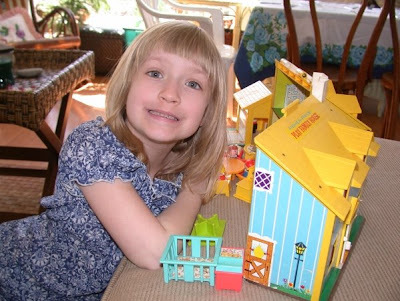 Flora was playing with the "little people" while she waited for the meal. Lucy received special attention. 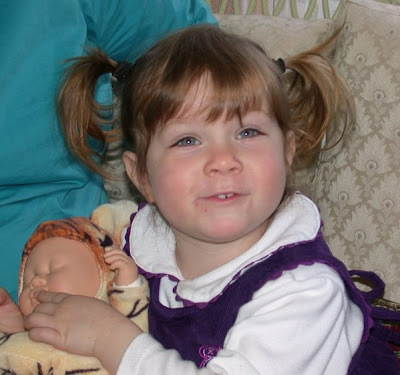 She was playing with her "leopard" baby. 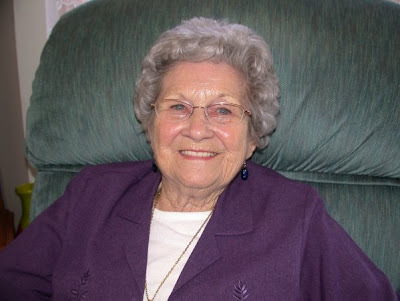 Grandma Great Meads arrived with sister Judy and brother-in-law Bill. 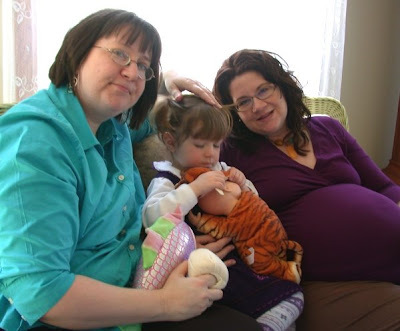 It is always wonderful to have her here with the celebration of family. Sam will be three next month. He is excited about having a new brother. 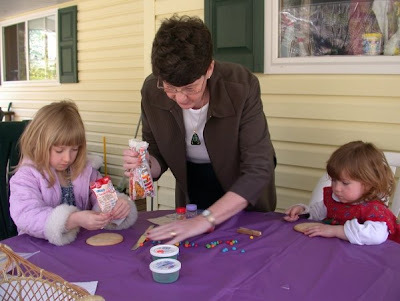 Judy, the wonderful preschool teacher she was, had a workshop for the kids. 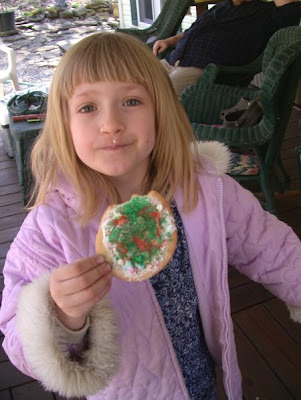 They decorated their own cookies. It is difficult to believe that Judy is now retired. 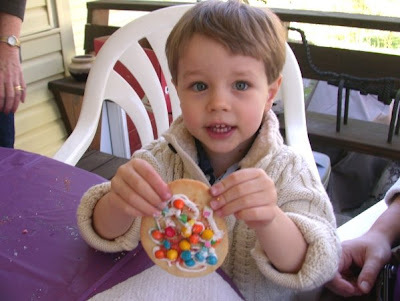 Look at the excitement of the cookie decoration! I forgot to mention that Shirley (Jeff's Mom) also joined us for the Easter celebration. After all the food, the kids needed some aerobic activities. It was a good day with family and friends. 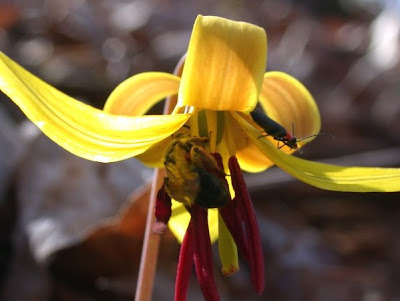 Yep, the spotted leaves of the yellow trout lily are up and the blossoms are super. As you can see the flowers attract a plethora of bees, wasps, beetles, and other insects. The primroses are also starting their rapid growth. Flowers are going to be plentiful this year. 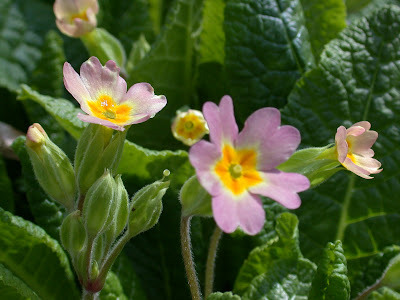 Shakespeare mentions primroses in several of his plays making them popular in Shakespearean themed gardens. 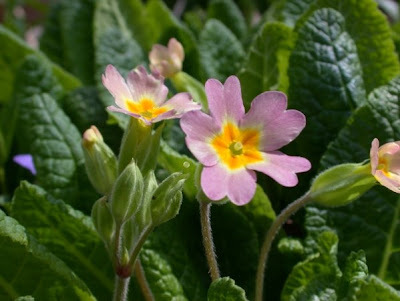 A vast amount of folk-lore and legend surrounds these bright flowers including the belief that the proper amount of primroses planted around a rock would create a fairy ring. 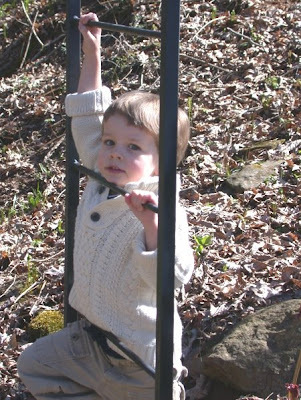 Wouldn't you love to see if you could create a fairy wonder-land in your garden? And then there are ramps! I can not dig these since they were planted in memory of James Phares. I am hoping they will cover the hillside. The first of this week was another taste of winter. Cold temperatures and snow showers were on the menu. It is now spring like and we hope that snow showers are a thing of the past for the rest of this April. As you can see from the above photo, the stink lilies (Voodoo lilies) are producing their interesting blossoms. 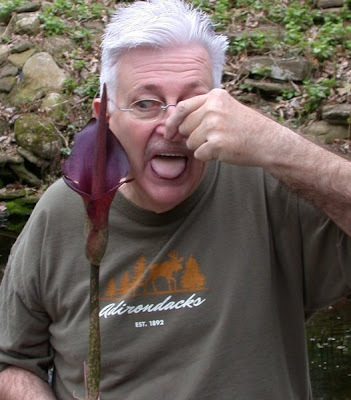 This flower may be small, but the smell of rotting flesh is still as strong. I actually had to pose quickly for the photo you see above. 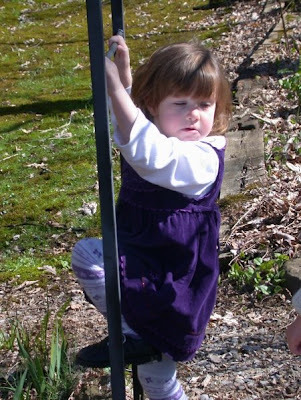 I really spent more time in preparation for the photo session looking like this! This is a rainy morning. The past few days have been more medical tests- you guessed it - they all come back saying that I am healthy as a zorse (OK, the hybrid produced by crossing a zebra with a horse may also be called a hebra!). 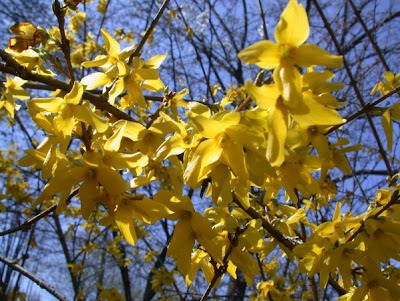 Yesterday was beautiful and all the trees and the spring flowers are showing themselves. 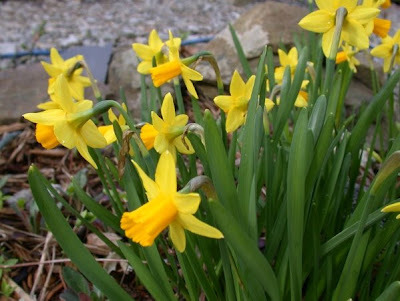 These minature daffodils above are so delicate as are the buds of the twinleaf below. 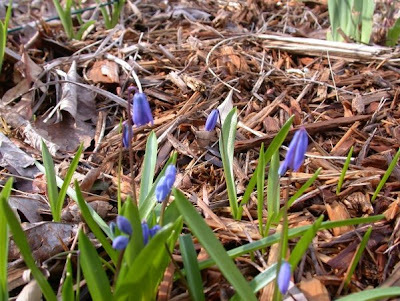 Blues are difficult to have in the garden, but you can always count on the Siberian squill. Despite the name, it is not from Siberia, but from other areas of Russia and Eurasia. 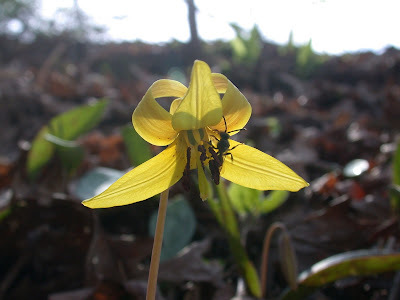 It is a very tough plant, however, growing in USDA zones 2 to 8. It has been cultivated since 1796. 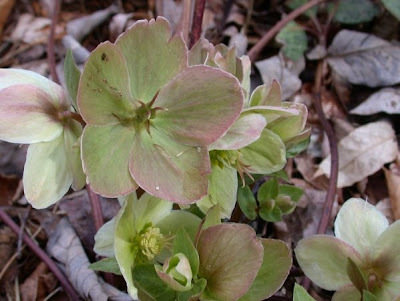 The hellebora (Linten rose) is now in full bloom and changing from white to green. I missed taking photos of the bloodroot. It is so temporal and the flowers so fragile. 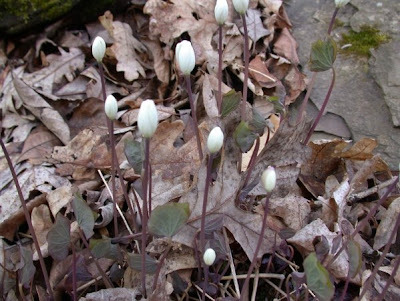 The bloodroot is another bloom that assures us that spring has arrived. 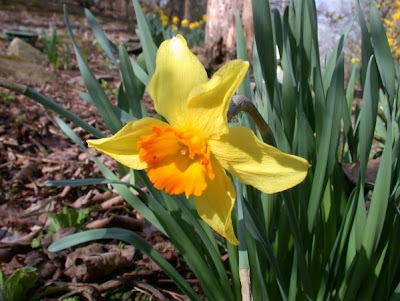 The big daffodils are, indeed showy! 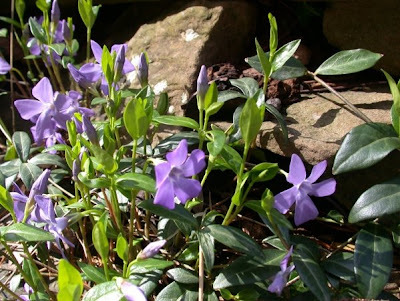 They are planted along with the other blue flower in the garden- the periwinkle. Our Bradford pear and cherry trees are splendid this year. 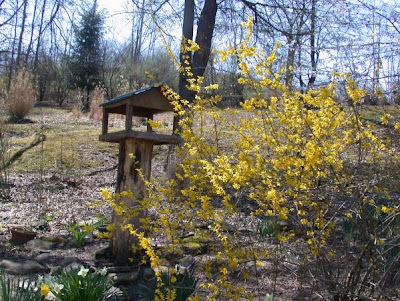 Forsythia is another happy blossom producing shrub. It is in the olive family. By the way, the ramps planted last year in the back garden are growing. It is about time to go ramping with friends. We need some ramps and potatoes! Have a great day!